I was a member of that widely disliked class of Ham Radio operators known as the "no-code General"; recently I upgraded to the universally loathed "no-code Extra". 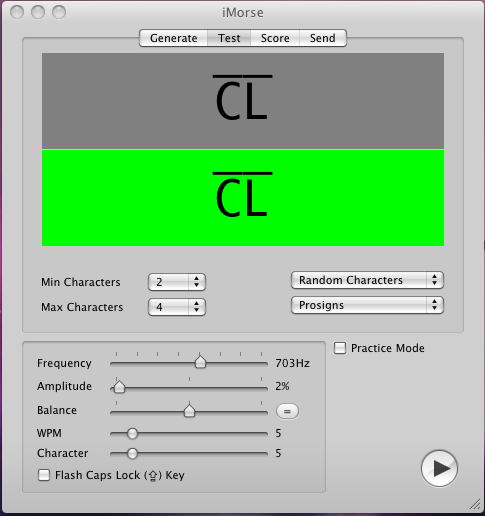 So I'm making an effort to learn the code, and because I didn't see any open-source Mac CW practice software out there I particularly liked, I decided to roll my own. Other useless features: flash your caps lock LED in time with the dits and dahs, Farnsworth spacing, left/right balance, very compact user interface, extremely bad Japanese localization (my specialty). ACMPlayer is a player for Baldur's Gate .acm music files and .mus playlist files. In theory it should work for all games that use the Interplay formats. Originally I ported ABel's C++ code (from acm2wav.exe) to Objective-C. The next version uses libacm compiled into the binary (shared libraries are evil). ACMPlayer can also export .acm and .mus files to AIFF. Originally I had hoped to produce a QuickTime plugin, but I did not know how to reconcile the slight nonlinearity of .mus playlists (i.e. "epilogues", or different endings depending on how far into the playlist you are) with QuickTime. So this application lets you play an epilogue at the next available stopping point. AIFF exports always choose the final epilogue (longest resulting file). Please note that releasing this code may be taken as an infringement of Interplay's IP/trade secrets/patents, so I would not be terribly surprised if I received a cease-and-desist notice. Get it while you can! This is a small OS X program that lets you know when your caps lock key is engaged, so you do not end up SHOUTING INSTEAD OF TYPING. It does this by putting up a transparent window with a cool-looking caps lock arrow symbol thingy. I rewrote it recently to require Mac OS 10.5 or later, so I could have fun using a Quartz event tap instead of a timer to detect a change in keyboard status. This thing now uses insignificant system resources. I use the System Prefs "Accounts" pane to add the program as a Login Item to my account. So, yes, I use this program on a daily basis at work. Here's a geenormous (420 KB) screenshot with the alert on screen. The Blugs List Management Engine was an open-source replacement for the Mac OS Data Browser (originally a replacement for the List Manager). All work has halted on the project due to the fact that there are no compelling reasons to use Carbon in preference to Cocoa for new development. 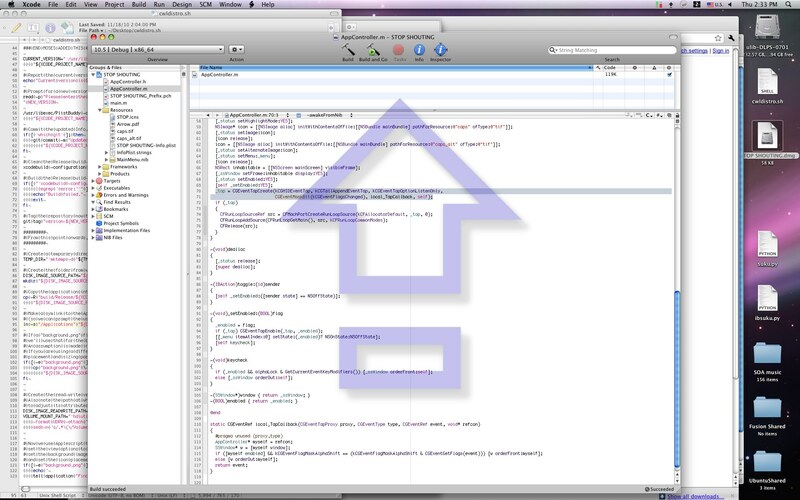 Blugs was released late enough in the OS X transition, and was not open-sourced soon enough subsequently, to survive. It was used in a few products, and was apparently up for consideration as the SuperCard List Engine. The Blugs source code is released under the very permissive ZLib License. It is in no way a supported product. That being said, here are the download links. MOSCH -- Mac OS Classic Handles -- is a small porting and convenience library for UNIX programmers. Translation: MOSCH -- Mac OS Classic Handles -- is a stupid 2-day fun programming project. Basically you get resizeable memory refs that can be passed around to different routines and resized without breaking the reference. (Compare and contrast with realloc()'s behavior.) I tried to reproduce all relevant portions of the Classic/Carbon Memory Manager. Of course the Mac OS handled memory in a very different way back in the Bad Old Days, so there are a lot of architecture-specific routines like CheckAllHeaps() that are simply no-ops in MOSCH. Download MOSCH for fun and profit, if you like reading uncommented code. As always, suggestions and job offers will be warmly received. VArrayLib is a rather simple implementation of variable-size arrays, lifted from the Blugs source code and made to stand alone. The Stockpile Manager is a replacement for the Apple's Collection Manager (which was part of the ill-fated QuickDraw GX). This was hot stuff back in 1997, but Core Foundation and AppKit have kinda taken the steam out of this particular project. Now where did I put my CodeWarrior t-shirt?